Meinl has clearly set out to create a set of contemporary sounding cymbals to sit happily within touching distance of its pro ranges. The high level of automation built into the manufacturing process should guarantee the sort of consistency that is normally difficult for cymbalmakers to attain. Of course, such consistency is only desirable if the sound and look of the cymbals is right in the first place and, our minor gripes about the rides aside, they are pretty much spot on. Contemporary sounding. Superb shiny finish. Well-made cymbals. Some minor complaints about the rides. German company Meinl produces a diverse range of cymbals, from entry-level models right through to handmade instruments of distinction. Occupying the space vacated by the company's popular but discontinued Amun line, the Mb8 series is an all-new range of B8 cymbals, which debuted at NAMM 2008. B8 is the ideal alloy for creating classic European-sounding (as opposed to Turkish/American) cymbals. The '8' in B8 refers to the percentage of tin within the cymbal alloy (eight percent tin to 92 percent copper). In general, the higher the quantity of tin, the warmer and more complex the cymbal becomes; smaller amounts of tin encourage brighter, cleaner sounds. Meinl is confident that the Mb8 cymbals are distinctive enough to provide clear separation from the nearest neighbouring range (Mb10). The fact that on paper there is a difference of only two percent between the Mb8 and Mb10 alloys shows the influence tin wields on the sound of a cymbal. Meinl is a forward-looking company that advocates the use of technology where appropriate. The Mb8 cymbals are cut from sheets of B8 rather than being individually cast but, as UK Meinl distributor Lee Worsley explained, the sheets of alloy still have to be cast with as much care as individual ingots. In keeping with Meinl's emphasis on technology and efficiency, the hammering is applied by robotic machines. Machine hammering delivers the sort of consistency that you'd expect a German company to both covet and achieve. Regular hammer marks are visible on top of the cymbals beneath broad bands of lathing. Remarkably, the lathing has also been worked by machine but the lathing patterns don't scream machine-made. Gaps of several millimetres between each band of lathing allow the stunning finish to catch the light. This is the result of a two-step high polish process that the cymbals undergo. 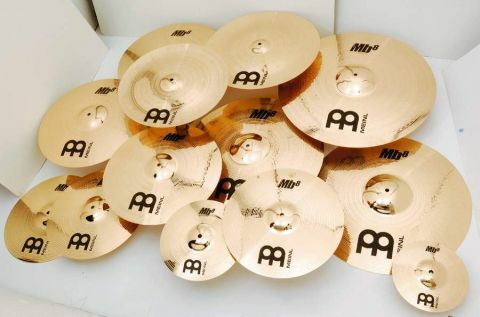 Meinl has something of a track record in producing shiny cymbals, and so has this look down to a T.
The only set of hi-hats currently in the range, the 14" Medium hats, give a flavour of Meinl's results. As expected, they produce clear, toppy attack, but a surprisingly deep and rounded note underpins things. When closed they are sharp and precise, while opening them brings a warm, frothy wash that doesn't overspill. All five of the medium crashes contain a similar balance of brightness and musical depth. They open rapidly with typical B8 brilliance, while the note that follows sits harmoniously below, leading to a smooth decay. The 14" model is understandably the highest in pitch; the 16" and 17" sit well together as a pair, blending sympathetically; and the 18" model possesses an altogether deeper voice and stronger character. The 20", meanwhile, would make a decent crash/ride - it's as happy pulsing out time as it is supplying a great wave of crash, and the wash that it produces isn't intrusive. We preferred the 20" medium crash to the 20" medium ride on account of its more rounded feel. The ride is a heavier cymbal and, though it cuts through well, is a little on the bright side. The 22" ride is a weightier version and so has even less trouble being heard. Like the 20", it delivers a clean stick sound with the high-end dominating, while the bell gives a suitably firm and penetrating response. Meinl also included a pair of splashes - 8" and 10" - whose performances mirrored that of the crashes in miniature. The pair of chinas, meanwhile, both fizz with trashy energy and boast instant explosions of aggressive tonality.